If you’re looking for an age-restricted 55 community near Daytona Beach, Florida, that promotes an active lifestyle, you might be satisfied with a resort-style pool and clubhouse combination that’s available for your daily use. But you don’t have to be. At Bear Creek, we understand that everyone’s needs and interests are different, and that’s why we offer three different clubhouses, each designed to answer specific needs for fitness, companionship, socializing, and entertainment. Clubhouse One has a “mountain lodge” design with rocking chairs on the spacious porch, comfy couches around a stone fireplace, a secluded pool, and nature trails. 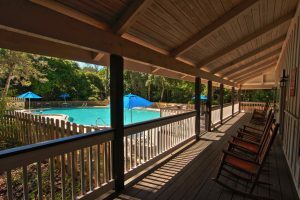 Clubhouse Two boasts a heated pool and hot tub; lighted courts for tennis, pickleball, and shuffleboard; game rooms; a video library with viewing screens; a banquet hall with a performance stage and dance floor; and a tiki hut. Clubhouse Three offers a fitness center, an aerobics room, a lap pool, and bocce ball courts. What’s more, just outside our age 55 community you’ll find a bevy of additional activities, including miles of world-renowned beaches, an international speedway, and even a golf course and country club that’s so close you can easily get there in your golf cart. Plus, you’ll be perfectly positioned to enjoy an endless roster of other adventures, including theme parks, nature preserves, historic places, sports venues, and more, all a day trip away from our Bear Creek 55 community. So come see what this beautiful 55 community near action-packed Daytona Beach, FL, has to offer. Contact one of our Lifestyle Consultants today to schedule a tour of this active community for residents 55 and older.